This is the story of the Ibis, once a slave ship, now a ship for exporting opium and on this voyage migrant workers headed to Mauritius. This voyage is special. Deeti, one of the passengers, had a vision of the Ibis and the people that will change her life. Her life has been governed by poppies, as she's watched village after village having to grow the flower to survive. Now, she's on the run, and the Ibis is her only option. Besides Deeti, Sea of Poppies is peppered with a cast of characters so large and quirky Dickens would be jealous. I'm only going to touch upon a few of them. Zachary is a mixed race American sailor with ambitions but a good heart. Paulette, a French orphan, must get to Mauritius to find her mother's family. Jodu is her foster brother, a charming Muslim boy, with dreams of becoming a sailor. Neel, one of two prisoners onboard, is headed to Mauritius to serve out his sentence for forgery. This book took me forever to finish. Not that I didn't like it. It was suffering from first book in a trilogy syndrome. There were a lot of starts and stops for the characters- so many characters. Just as I would get comfortable with one character's story, the book would switch to another. I would have to remember what was happening in that character's storyline again. Over and over. This would take me out of the story and I'd lose interest. It took so long to establish the back stories and reasons why the characters ended up on the ship, that it was more than halfway through the book before they even got to the ship. I am a bit frustrated at how long it took to get the plot going. Some of it might not have been needed. I'm thinking of Paulette who has plenty of good reasons to want to run away. Ghosh had to add one more weird thing. It was gilding the lily at that point. Sure, it added to the British merchants ridiculousness, but they were already ridiculous. It was time to get things moving along. I think the second book should pick up the pace- at least I hope it would-unless a whole new cast of characters is added. I guess I'll have to wait to see. 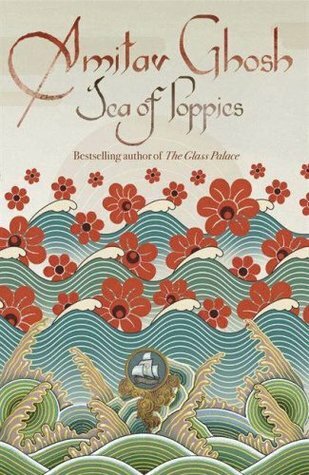 Sea of Poppies is funny at times, with characters you either love or hate. It's an old fashioned adventure, much like the Aubrey-Maturin series, with a less Eurocentric flavour. How do you feel about series? Do you find they take too long to establish themselves? Ugh, I think I would really struggle with the beginning of the book. Yeah, it's a real investment. I don't mind a time investment if it's worth it. I've been meaning to read Ghosh, but I might start with one of his standalone novels. I have heard a lot about this book, but never picked it up myself... In the old days I always used to find that the first book in a trilogy was good, the second book kind of dragged, and then the third book was awesome. That doesn't really seem to be the same formula they use nowadays. Nerp, I'm too fickle for a book that takes a long time to establish itself. Sounds like a book I would DNF. Er um -- don't be mad but the second book basically has a whole new cast of characters. So maybe this series maybe possibly isn't for you? Nooooooooooooooooo! Seriously though, another cast of characters? Yeah, I can't do it. I'm just going to pretend they all lived happily ever after.